One of the biggest challenges facing homeowners when it comes to purchasing new patio doors is often that they have no idea what the doors will look like. This leads to much prevarication and confusion. 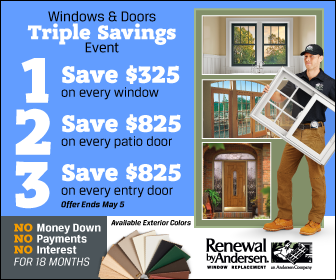 Renewal by Andersen® takes pride in our Window & Door Visualizer, which gives you an opportunity to see the many design options available to you before you make a purchase. We show you how to work through them. If you don’t have an image of your home to work with, you can preview your new patio doors in St. Louis on top of several pre-saved images of some of the most popular home styles in America. These include interior shots of common rooms so you can visualize the patio door from all angles. All you have to do is select the image you want to use, then pick patio door as the option. Note that you need to select an image that features a patio door. You can then customize the look of this particular item from the frame, to the trim, and the changes will be reflected onto the image accordingly. First, you need to upload the picture that you want to specifically use. Second, pick an object of known size in the image and set the red line to that object while inputting that size. Third, you have to decide if it’s an interior or exterior shot. Lastly, you have to define the windows and doors. There’s a semi-translucent box where you can redefine the edges to overlay onto the image properly. Clicking on ‘next’ lets you easily preview your new windows and entry doors in St. Louis, MO. Once you’re done, clicking on review brings up the summary of the patio door and details that you chose. This lets you get the precise option that you’ve previewed, whether you need St. Louis French doors or casement windows. For even more comprehensive help, call Renewal by Andersen of St. Louis today at (314) 332-2364.